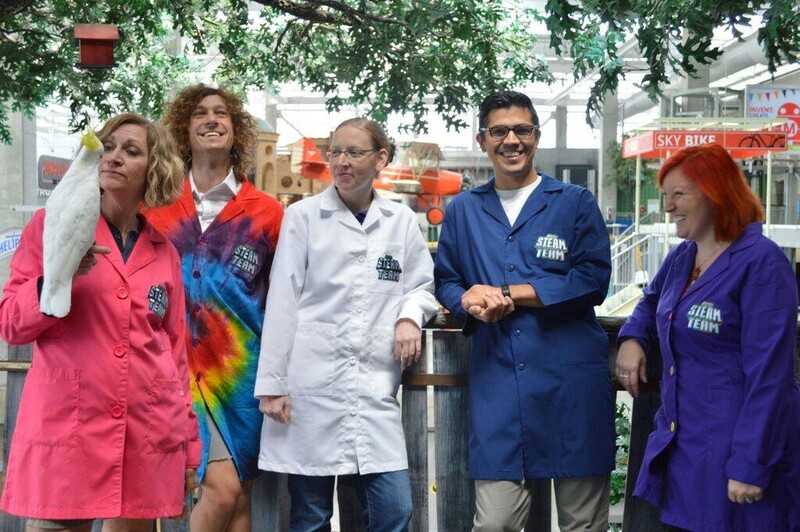 Science City staff. Courtesy of Science City. 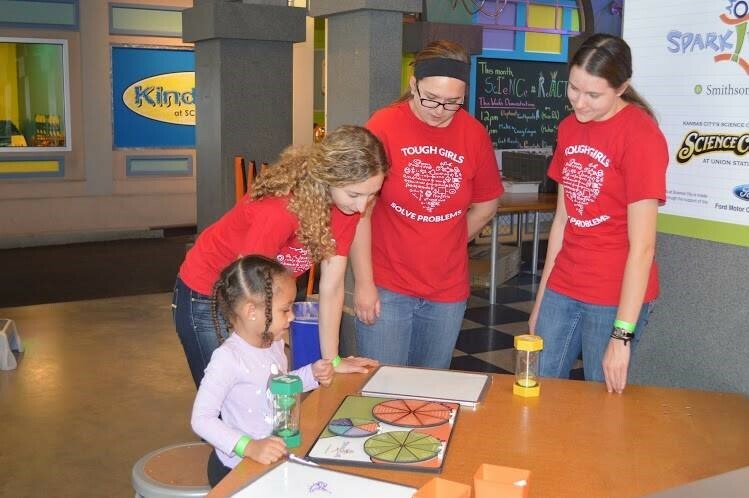 At Kansas City’s science center, Science City, guests learn about fossil fuel emissions, water conservation, and sustainable energy. While these exhibits encourage guests to consider or reconsider their impact on our community, region, and planet, Spark!Lab challenges these same guests to think about how they might invent something to solve a global, regional, or local problem. At Science City, we’re often wearing several hats; if we’re not facilitating an exhibit, we may be teaching a class or developing a new activity. One afternoon, after fielding questions and comments about climate change’s global impacts, I began to facilitate Spark!Lab. It wasn’t very busy and I had time to connect dots that I hadn’t before: by encouraging guests to engage with the invention process, we’re fostering a lifelong appreciation of overcoming challenges, of solving problems. Whether guests are prototyping, testing their invention, or having a conversation with a facilitator or grandparent about their invention, Spark!Lab activities promote an understanding and familiarity with the invention process. Visitors to Spark!Lab at Science City work their way through an invention challenge. Courtesy of Science City. Specifically, the “Now What?” and “Hydroponics” activities cultivate a sense of invention in a world of limited resources. Asking a guest how they might catch a puppy using a roll of aluminum foil and a recycling bin of materials primes their mind to consider how they might resolve a real-life challenge in a world with limited resources. Likewise, making a garden without soil opens guests up to considering how one might grow food indoors or with limited water. These are fun activities, but they are more than that. They encourage an appreciation and aptitude for problem-solving. In a rapidly-changing, unpredictable world, inventive skills will be invaluable. Spark!Lab provides us an opportunity to enrich those skills in both guests and facilitators. As they leave Spark!Lab, they’ll begin to see themselves as inventive thinkers, as problem-solvers, as the kind of people that will help us sustain ourselves and our planet. The world is changing more rapidly than ever in the history of our species as we continue to burn fossil fuels that release heat-trapping carbon dioxide into our atmosphere. The tropics are expanding as sea levels rise. The seasonal El Niño has become less predictable, disrupting fishing seasons and causing drought and torrential rain to become the “new normal”. The ice at our poles is shrinking, reflecting less and less heat away from our globe every day. The future, already unpredictable, is more uncertain than ever. As resources become limited and never-before-encountered problems arise, we must be resilient. We must be flexible. We must be inventive.